Nintendo DS Limited Edition Po.. Product weight is 1.75 lbs. Limited Edition Onyx Nintendo DS Lite with silkscreen of Dialgo & Palkia from Pokémon Diamond & Pearl Pokémon Mystery Dungeon: Explorers of Time and Pokémon Mystery Dungeon: Explorers of Darkness special animated episode DVD Pokémon Dialgo & Palkia Carrying Case Collectible mini-poster featuring Grovyle from Pokémon Mystery Dungeon: Explorers of Time and Pokémon Mystery Dungeon: Explorers of Darkness Anyone who loves Pokémon knows a rare treasure when they see one. A treasure that is sure to be sought after is Nintendo’s new Nintendo DS Limited Edition Pokémon Pack, which includes a Pokémon-themed Nintendo DS handheld game system and exclusive Pokémon premiums. 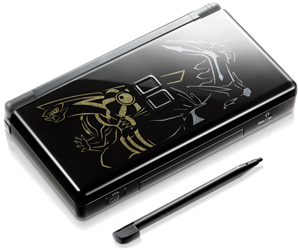 The Nintendo DS Limited Edition Pokémon Pack features a custom Onyx Nintendo DS emblazoned with images of Dialga™ and Palkia™, two of the most legendary characters from the Pokémon Diamond and Pokémon Pearl games. 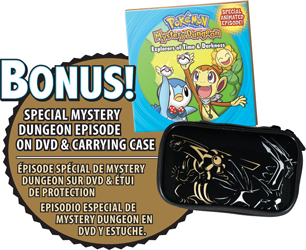 The set also includes a never-before-released animated special: "Pokémon Mystery Dungeon: Explorers of Time and Darkness" (based on the story of the two newest Pokémon DS titles). Plus, a cool Dialga and Palkia carrying case, and a collectible mini-poster. Anyone who loves Pokémon knows a rare treasure when they see one. A treasure that is sure to be sought after is Nintendo’s new Nintendo DS Limited Edition Pokémon Pack, which includes a Pokémon-themed Nintendo DS handheld game system and exclusive Pokémon premiums. 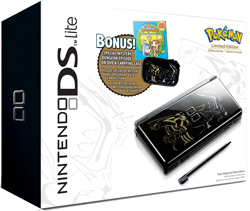 The Nintendo DS Limited Edition Pokémon Pack features a custom Onyx Nintendo DS emblazoned with images of Dialga and Palkia, two of the most legendary characters from the Pokémon Diamond and Pokémon Pearl games. The set also includes a never-before-released animated special: "Pokémon Mystery Dungeon: Explorers of Time and Darkness" (based on the story of the two newest Pokémon DS titles). Plus, get a cool Dialga and Palkia carrying case, and a collectible mini-poster. About Nintendo's DS The best-selling video game system in the world grabs attention with a splash of color and looks good whether it’s toted in your school backpack, pulled from your purse, or riding with you on a family trip. The new Pokémon-themed Nintendo DS handheld game system joins Polar White, Coral Pink, Onyx, Crimson/Black, and Cobalt/Black. SystemWith Nintendo DS Lite, dual screens and touch-screen technology allow you to interact with games like never before. Wireless communication allows you to experience real-time multiplayer gameplay, and the free Nintendo Wi-Fi Connection service allows you to compete against players from around the globe.Dual Screens: Two incredibly bright LCD screens offer one of the most groundbreaking gameplay advances ever developed. Each 3-inch screen can reproduce a true 3D view, with impressive 3D renderings that can surpass images displayed on the Nintendo 64. Nintendo Wi-Fi Connection:Ready to take on the world? Now, with Nintendo Wi-Fi Connection, you can connect wirelessly, chat and play with Nintendo DS owners across the globe. All you need to play is a Nintendo DS and a Wi-Fi-ready game. There are no subscription fees -- the service is free!Touch Screen Technology:The lower screen offers something never before provided by any dedicated game device: touch-screen capabilities. You no longer have to rely on just buttons to move your character or shift perspectives. Navigate menus or access inventory items simply by touching the screen with a stylus or fingertip. The possibilities are limited only by developers' imaginations. The touch screen features a tougher film cover for durability, and the included stylus is stored in the back of the unit.Microphone Port:A built-in microphone port means that with Nintendo DS, you only need to tell your games what to do. The Nintendo DS microphone gives you even more ways to interact with your favorite games.Wireless Network:With Nintendo DS Lite, you can connect with a local wireless network of up to 16 players. The wireless range can be an incredible 30 to 100 feet and for some games, multiplayer requires just one Nintendo DS game card.Note: Nintendo DS Lite wireless communication, including PictoChat, is not private and is not monitored by Nintendo. We recommend that you never reveal any personal information or arrange to meet a stranger.Rich Stereo Sound:Nintendo DS Lite sound capabilities allow for greatly expanded use of voices and music, and a richer, more immersive game experience. Stereo speakers allow for virtual surround sound and a plug for headphones transmits stereo sound.Backward Compatibility:Nintendo DS Lite features a separate media port for Game Boy Advance cartridges, allowing you to play all your favorite Game Boy Advance games in single-player mode.Technical Specs:Size (closed): 133 millimeters (5.2 inches) wide, 73.9 millimeters (2.9 inches) long, 21.5 millimeters (0.85 inches) tall.Top Screen: A backlit, 3-inch, transmissive TFT color LCD with 256 x 192 pixel resolution and .24 mm dot pitch, capable of displaying 260,000 colors.Touch Screen: Same specs as top screen, but with a transparent analog touch screen.Wireless Communication: IEEE 802.11 and Nintendo’s proprietary format; wireless range is 30 to 100 feet, depending on circumstances; multiple users can play multiplayer games using just one DS game card.Controls: Touch screen, embedded microphone for voice recognition, A/B/X/Y face buttons, plus control pad, L/R shoulder buttons, Start and Select buttons. The stylus is 1 centimeter longer and 2 millimeters thicker than the stylus of the original Nintendo DS.Input/Output: Ports for both Nintendo DS game cards and Game Boy Advance game paks, terminals for stereo headphones and microphone. A removable cover for the Game Boy Advance game pak slot provides added protection from dust and other foreign materials.Other Features: Embedded PictoChat software that allows up to 16 users within local range of one another to chat at once; embedded real-time clock; date, time and alarm; touch-screen calibration.CPUs: One ARM9 and one ARM7.Sound: Stereo speakers providing virtual surround sound, depending on the software. Battery: Lithium ion battery delivering five to 19 hours of play on a four-hour charge, depending on use; power-saving sleep mode; AC adapter. Languages: English, Japanese, Spanish, French, German, Italian.